Nowadays Credit Card Poker games are somewhat ubiquitous, but due to regulation and several mishappens, the use of Bitcoin as payment method has risen in strength. Even so, today the easiest and certain method by which you can start playing online poker is with a credit card. So this artiles goes to the people who may have some questions regarding this payment method while gambling online. Gift cards are one-time pre-paid cards which are issued by credit card companies like Visa, MasterCard, or American Express. 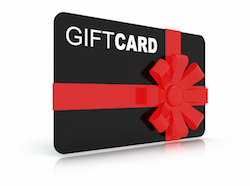 Gift cards are available at Walmart, Target, Walgreen’s, CVS, and other retail chains. Online poker sites like players to fund their accounts with gift cards and prepaid cards, because it represents money already paid, so there’s no question about payment later. For online poker players, gift card deposits provide a layer of privacy and security that a credit card transaction might not have. Prepaid credit cards are similar to gift cards, except they are not a one-time expedient. A player buys prepaid cards at the same retail stores they would buy a gift card, but the prepaid card is registered with Visa, MasterCard, or Amex. This allows poker players to reload their prepaid card for a small fee. If you look at several US internet poker rooms, you’ll quickly notice how Visa is easily the most widely accepted card while Mastercard is on the second place and American Express well after those two. Sometimes, though, you’ll find out that a site accepts more credit card brands than the ones mentioned on their websites. Credit cards, gift cards, and prepaid cards with the Visa or MasterCard logo are best for online poker deposits, because more sites accept those cards than American Express. Though not as widespread, Amex deposits are common in the online poker industry, so you’ll find hundreds of online card sites which accept American Express payments. Almost all poker sites allow players to fund their accounts with MasterCard or Visa. Anywhere that MasterCard or Visa credit cards are accepted, you can make online poker gift card deposits. Can I Deposit with a Credit Card to play Poker? To online gamblers outside of the US, the answer is mostly “Yes.” To US citizens, it’s “Maybe.” In short, the only way to find out is to try since it varies on case-by-case basis. We ran a mini-survey in February 2015 by e-mailing five well-known US online poker sites and asking how often card deposits go through at their respective sites. Discover Card users face more obstacles when making an international deposit, but online casinos that accept American players often accept Discover Card deposits. Discover Card uses a code that blocks international payments, but if you call your card issuer, you can have the block on international payments waived. It’s an added obstacle, but takes only one phone call when you join a new online poker site. Discover Card has a partnership with JCB (Japanese Credit Bureau) to issue cards for North America for JCB cardholders, so anyone with a Discover Card who plays in the Asian poker market should research the possibility of acquiring a JCB credit card. BetOnline Poker is one of the most secure and trusted online poker sites which accepts players from the United States. BetOnline launched in 2004 as an online sportsbook, but it opened an online poker room in 2011. BetOnline Poker requires a verification process for credit card users, but this assures the security of your credit card information. To use a Visa or Mastercard at BetOnline Poker, strong, provide copies of the front and back of any card you’ve used on your account, and either a bank statement or utility bill that confirms your physical address. Your first withdrawal might take extra time, but as soon as you verify your account, BetOnline Poker will provide secure, fast, and reliable withdrawals. BetOnline Poker has a $2,500, 100% welcome bonus for new players who use the bonus code “NEWBOL“. The bonus applies to any deposits between $50 and $2,500, while $5 of bonus money added to your account at a time. Players have 60 days to release their bonus funds. BetOnline Poker also has a $5,000 New Player Freeroll tournament for registrants, along with a weekly $100,000 Guaranteed event every Sunday night. 888 Poker is good option for international poker players. 888poker is licensed by the UK Gambling Commission and the Gibraltar Gaming Authority, so it is monitored by the most respected gaming regulators in the world. 888poker uses state-of-the-art encryption software and verification techniques to provide a safe and secure poker experience for its customers. Even better, 888 Poker is tied to 888sports and 888casino, so many fish are found in its online card rooms. Americans from New Jersey and Nevada can play at 888 Poker, but otherwise, it’s an international crowd. 888 Poker has a $400, 100% deposit bonus and a $88 free no-deposit bonus. New members receive 7 tickets to $500 first depositors’ freeroll tournaments, 2 tickets to $1000 depositors’ free tournaments, and 1 ticket to the First Depositors’ Challenge Tournament. For poker players from the UK and continental Europe, 888poker’s combination of large welcome promotions and safe deposits represents the best deal in credit card-based online poker. 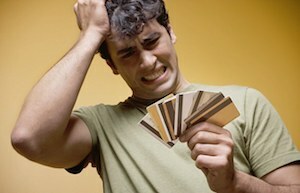 Poker players should consider the advantages of using a credit card while playing online poker. Credit cards have rewards programs, which have to be figured into the economics of online card playing. For instance, many card players put a lot of thought into which poker rooms have the best welcome bonuses and reload bonuses. Site promotions are important, but if a player makes a deposit using a credit card, then they receive cashback rewards from their Visa or MasterCard, too. Using credit cards while betting on poker online allows a player to receive two bonuses at one time. Credit card deposits and withdrawals have no fees at most poker sites, so using Visa, MasterCard, or Amex does not hurt your poker bankroll. Credit cards have instant deposits, while withdrawals tend to take between 24 to 48 hours to reach your account. Beyond mere finances, you’ll receive a monthly list of transactions from your credit card company, so you can track how much you spend on poker in a month’s time. Prepaid cards and gift cards allow you to spend only what you can afford, but credit cards help you track spending better. For certain players, credit cards have some drawbacks. Credit card poker withdrawals take longer than bitcoin withdrawals. If you want to receive the quickest payment possible, then you’ll want to use a bitcoin wallet or other blockchain payment method. Online poker sites also have smaller withdrawal limits for credit cards than bank wire transfers, checks by mail or courier, or ACH. Other payment methods come with fees and sometimes take weeks to reach your bank account, so credit card has major advantages over checks and bank transfers. Study each to determine the payment method which is best for you. One other drawback should be considered: if managing your bankroll is an issue, playing on credit is not a good option. Players who struggle with responsible gaming should read about money management techniques. Study pot odds, refresh your understanding of hand strength, and learn how to get the most out of your poker stake. All poker players have winning streaks and losing streaks, but Texas Hold’em and other poker variants are games of skill. Most of all, when you play on credit, know how to avoid going on tilt. What’s the Problem with sucessful deposits? Depositing successfully to US poker sites with a credit, debit or a gift card has been uncertain for several years already. In 2006, the Unlawful Internet Gambling Enforcement Act became a law. US citizens are still depositing money online gambling sites but doing so got more difficult since the UIGEA. Now, US credit card companies and issuers decline all transactions that may be related to unlawful gambling – in fact, they’re so strict about this policy that even customers at legal and licensed US poker sites are having trouble with their card deposits. Players should keep in mind a few important statistics about using credit card while playing online poker. Credit card fraud and identity theft are serious issues. Over 30 million Americans are victims of credit card fraud (defined as the theft of a single card) each year. If you are a victim of credit card fraud, then the Fair Credit Billing Act (FCBA) states you are liable only for $50 of the fraud per case, according to the Federal Trade Commission (FTC). The NASDAQ reports that credit card fraud is on the decline, because of security measures like chip technology being implemented. Identity theft is a more serious issue. Identity theft means your personal information is stolen, instead of a single card. In this case, the criminal can open multiple credit cards in your name, thus ruining your credit history. At the same time, the NASDAQ says identity theft will increase from $9 billion lost in 2014 to $19 billion lost by 2018, so players should be aware of the dangers. Only select online poker sites which use the latest 128-bit encryption technology and SSL certificates. Pick trusted sites that are known to be safe, secure, and private. 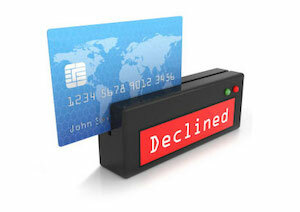 Those playing in the New Jersey online poker market need to remember that Visa and MasterCard decline at a high rate. These are the “7995” failures: credit card poker payments which decline because of the 7995-transaction code for gambling-related transactions. Over the first couple of years of legal online poker in New Jersey, 70% of Visa deposits and 45% of MasterCard deposits were declined. The credit card success rate has improved over time, but credit card payments are rejected sometimes. This points out a wider issue with credit card institutions. Visa and MasterCard are not one single corporation, but a network comprised of 20,000 or more financial institutions. Each credit card is issued by a single bank in the credit card network. Each of these banks sets its own transaction policies, so if one of your credit cards declines at a poker site, try one of your other cards. On September 4, 2017, the Winning Poker Network (WPN) and America’s Card Room were victims of a cyber-attack. Philip Nagy, the CEO of WPN, said he believed a rival poker site launched the cyber-attack. The South Korean government claimed earlier this year that North Korea has 1,700 hackers paid to launch cyber-attacks on online poker rooms and other gambling sites, for the sake of generating revenues for the cash-strapped North Korean government. In 2013, Doug “WCGRider” Polk claimed he lost $35,000 on PokerStars to a mysterious player named “Forbidden536”, whom he claimed hacked his computer. Polk said his opponent made decisions only consistent with someone who could see his hole cards. Those aren’t the only famous cyber-attacks in online poker history. Absolute Poker had an infamous breach of security in 2007, while Ultimate Bet had a breach in 2011. Luckily, you won’t find nearly as many infamous moments in the history of credit card-related online poker hacks. 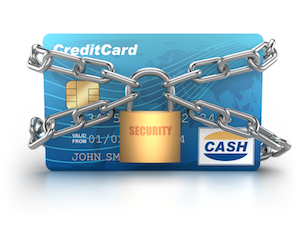 If you use the most trusted online card sites, your information is going to be secure. That’s why it’s important to play in online and mobile poker rooms with a reputation for security and safety. If credit card poker companies and issuers have no idea of the intent of the transaction – in other words, that it will be used for online gambling purposes – they have little reason to decline it unless it raises flags for something else that’s considered illegal. To hide the intent of transactions, online poker companies use other companies as sort of payment processors in order to make it look like the transaction concerns something legal (here’s a fascinating interview with Chad Elie which details how he worked as a payment processor for Full Tilt Poker when they operated in the US). How to Cashout a Credit Card Poker Deposit? 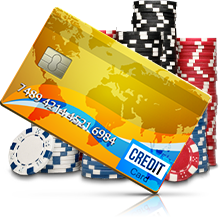 Generally, the only way to withdraw money from USA poker websites after making a credit, debit or gift card deposit is to order a check. While a card deposit delivers money to your player account instantly, check cashouts can take several weeks to process. Only the most trusted US online poker rooms deliver check payouts within two weeks (as of right now, Bovada has the fastest check cashouts at around 10 days). If using a credit, debit or gift card is unavailable or fails to work, are there any deposit methods left for US citizens? Yes. Money transfer services like Western Union seem to be getting increasingly popular as they’re not subject to failure rates like credit cards, and they simply get the job done. You can fund a money transfer service account by depositing money to an online account by, for example, using a credit card (the same one that might have been declined at an online poker website). The other option is to go to one of their live locations and deposit the money there. Money withdrawals can also be done either online or live. Money transfer deposits cost more than card deposits (in general, at least) but in many cases poker sites are willing to cover the deposit costs if the size of the deposit is big enough. On the flipside, money transfer withdrawals are faster than check withdrawals. Are you looking for another payment method? You can easily find reviews about payment methods on our main page, where you can find small reviews for each payment method, and direct links to detailed pages with great in-depth information.